Two weeks ago I was able to attend the Galileo Enrichment Learning Program's event Unlocking the Secrets to Singapore Math, the purpose of which is to not only introduce the topic but to give us a preview of the 2nd Singapore Math Learning Festival. I have been hearing about Singapore Math before but that was the first time I actually learned about what is it about. Singapore Math focuses on developing critical thinking through mastery of foundational skills. It teaches students a systematic way of learning seemingly difficult math concepts through child-friendly terms and relatable experiences. It uses the C-P-A approach. This complements the K-12 curriculum, as it strengthens key concepts and provides opportunities to apply it in daily activities as well as in other subjects. The K-12 program, launched by DepEd this school year which started with the Grade 7 students and Kinder, is an initiative to give students opportunities to master essential skills and competencies by stretching and extending their learning years to the 12th grade. It focuses on depth rather than on breadth, giving them more time to realize the importance of each concept and connect it to more complex and higher learning. During the event, I was surprised how Singapore Math makes mathematical concepts easy for young minds to understand. That is why as a father, I intend to enroll my son in Galileo's enrichment learning program for math to help him have a good foundation in mathematics so that he will enjoy the subject than endure it. 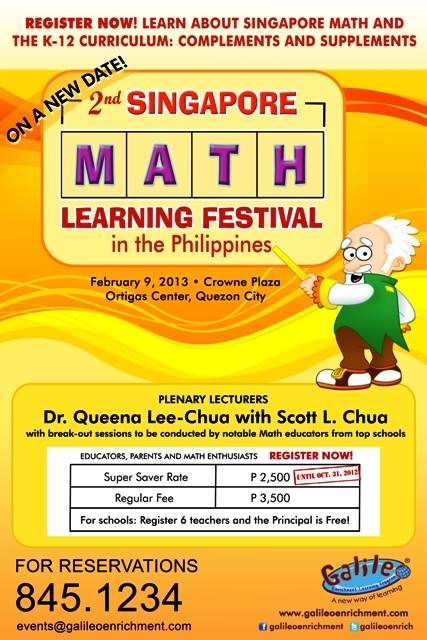 The 2nd Singapore Math Learning Festival will be held on February 9, 2013 at the Crown Plaza Hotel at Ortigas. The conference will focus on how Singapore Math can complement and provide supplementary learning to the implementation of the K-12 program, a new development of the Department of Education. The conference will also feature a plenary lecture by Dr. Queena Lee-Chua (one of my former math professors in ADMU) – Math professor and multi-awarded educator – and her son Scott Chua, a multi-awarded student and a Carlos Palanca Awardee for Literature. For more inquiries on 2nd Singapore Math Learning Festival, contact Galileo's head office at 845-1234 or send an email to info@galileoenrichment.com.